The ancient Romans called the Mediterranean Sea 'Mare Nostrum', which is Latin for 'Our Sea'. 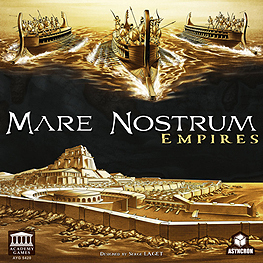 'Mare Nostrum - Empires' is an empire building game in which 3-5 players lead their individual empires to dominion of the ancient world. You grow the fame and glory of your empire by expanding your influence into new Provinces, then extending your Trade Caravans, building Markets, and founding new Cities and Temples. You may also recruit Heroes and create Wonders to advance your empire's cause. But beware of your 'friends', for they may look upon your gains with envy and greed...and thwart your progress towards dominance of Mare Nostrum! You determine your Empire's destiny when you choose your strategy and win the game through either Fame, Prestige, Conquest, or Leadership! 5 Empire Miniatures and Markers sets.